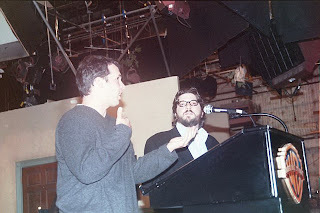 Moses Port (left) and David Guarascio (right) at PennclubLA's "Penn in Pictures"
Penn alumni and writing partners David Guarascio (C'91) and Moses Port (C'91), (former co-producers and writers of "Just Shoot Me ", "Aliens in America" ...and 2001 "Penn in Pictures" panelists) are now developing a new comedy for ABC that's "very 2010". Learn more about what I mean after the jump! After CBS produced "$#*! My Dad Says " it seems like Hollywood is getting ideas for TV shows from the web. 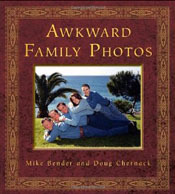 On that note, Guarascio and Port are developing "Awkward Family Photos", a show that will be based on the website and book of the same name from Mike Bender and Doug Chernack. (source) The photos that are showcased are totally random ...and horrid! Curious to see what David and Moses develop! ...And this is just another story of ABC continuing to love on our Penn alumni! 2 Penn alumni "journalists" appear on "30 Rock"